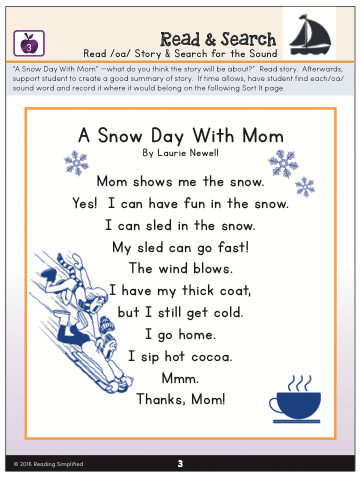 Miracles of miracles you’re keeping pace with your reading series’ phonics scope and sequence…. But you have this niggling voice in the back of your head causing you doubt every time to you listen to a couple of your groups during guided reading. But when she encounters “boat,” she says “/bo/ /at/” and looks up in confusion. Worse still, this student isn’t the only one who doesn’t seem to be memorizing the phonics information–that you’ve taught in a variety of ways. So what do you DO about this all-too-common pattern of weak phonics memorizing? 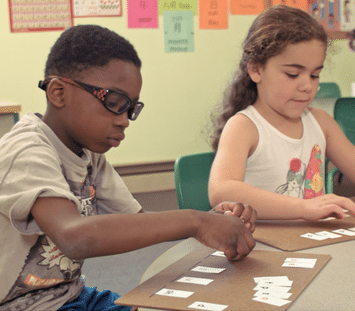 Based on research, tutoring, and observing hundreds of other teachers, I’ve discovered that a simple, repeatable pairing of activities helps students’ phonics memorization abilities. 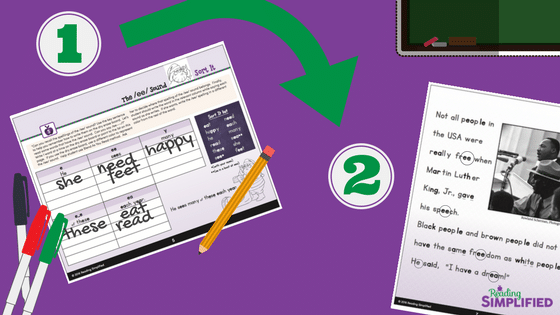 In this post, I’d like to present this simplified pairing of activities for Word Work and Guided Reading to you, as well as provide a complementary, differentiated packet of activities about MLK, Jr., so you can immediately see how your students respond. Why does the phonics not stick? Surely it must be poor visual memory, right? Well, yes, it CAN be, and often is. HOWEVER, many, many students don’t “see” the phonics if they first don’t “hear” the sounds in words. Most students who are slower to pick up phonics memorizing and/or decode and/or recognize words, lack strong phonemic awareness and a strong sound-based decoding approach to the code (see animation above). Most students have only adequate or poor word attack skills….they lack the ability to line up each sound with it’s corresponding symbol in succession rapidly and smoothly. Thus, without a super-strong sound-based decoding foundation, phonics information just doesn’t stick very well. If the brain doesn’t notice that the word, “brain” consists of these sounds: /b/ /r/ /ay/ /n/, it can’t as easily attach the “ai” spelling with the /ay/ sound. The brain of great readers find this easy to do, and they usually have an excellent sound-based decoding foundation. So when we don’t see the phonic info we’re teaching sticking, we should examine the student’s sound-based decoding (aka word attack) and bolster it. The triangle model above shows that sound-based decoding is the foundation; word identification (which requires memorizing phonics-level and word-level info) is built on that. If our students have having a break-down at this word identification level, it is most likely because their foundation is weak. Once a student begins to identify words, the next stage of development is an emphasis on fluency building–not just identifying words, but doing so rapidly. Finally, once a reader is fluent, she spends the rest of her life reading widely and developing greater and greater vocabulary knowledge and comprehension skills. 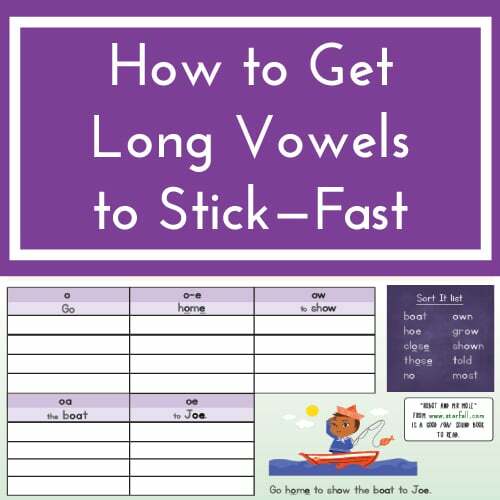 I’ve discussed this issue and and how to determine if your student(s) has strong word attack here, so for now I just want to point you to 2 preliminary activities that help ensure a strong foundation for memorizing phonics. Switch It is our #1 hack for developing strong word attack (aka sound-based decoding). 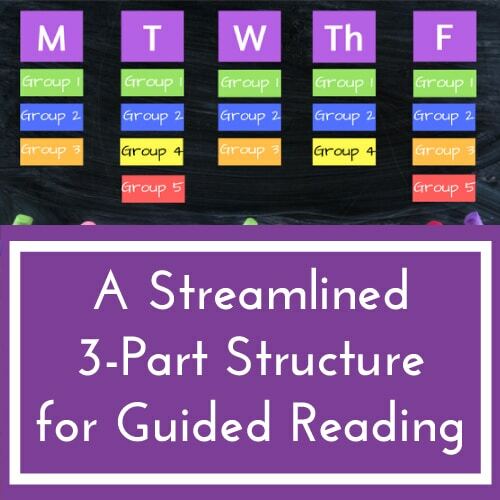 I’ve been seeing children make leaps and bounds in their reading achievement with this activity for 20 years. Gains in a matter of minutes and hours! And yet, this activity still never ceases to amaze me with its power. The teacher asks a child or small group of children to build a 1-syllable, short vowel word with letter-sound cards, such as “rich”. Then she challenges them to hear the difference between that word and the next word (e.g., “which”), which usually varies by one sound (or phoneme). 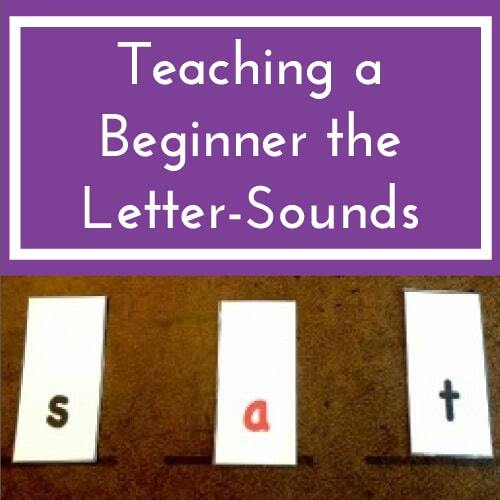 Two of the secrets of Switch It is that the teacher is daily looking to increase the phonemic difficulty of the words. In other words, if today most students in her group didn’t need much help with CVC Switch It, then tomorrow she will add in words with the CVCC pattern, working up to CCCVCC words in a matters of weeks. AND, she’s daily adding more and more letter-sounds to the students’ repertoire, with a special focus on short vowels. However, Switch It alone is insufficient because it doesn’t give students coaching, practice and support in how to blend sounds to make a word. That’s why we recommend teachers couple Switch It with Read It. Read It helps solve all the blending problems we’ve ever encountered. Read It is just like it sounds! Students read words (often that have been written on dry erase boards). Then they practice writing and saying each sound–phoneme by phoneme with a dry erase marker. 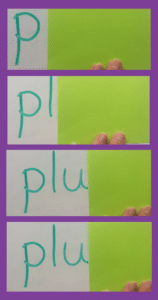 Finally, they erase the letter-sounds, left-to-right, also saying aloud each phoneme. The secret to Read It is the Blend As You Read strategy which helps eliminate blending problems from the CVC to the CCVCC and even to the Multi-syllable word level. 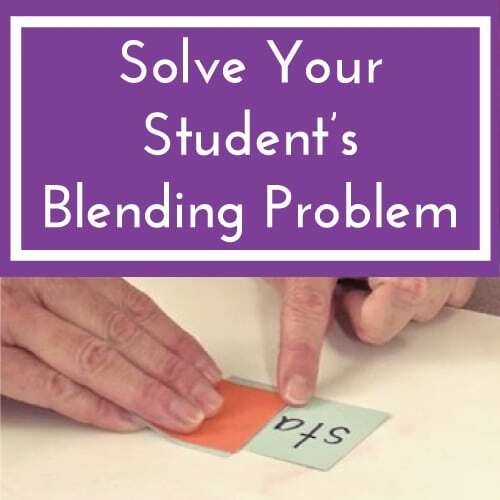 The Blend As You Read strategy ask the student to put each sound together as he goes through the word. Rather than first saying each phoneme, we coach the student to put the first 2 phonemes together. Then the 3rd. Then the 4th, etc. In sum, if you’re concerned that a student (or more) of yours isn’t memorizing the phonics information you’ve been teaching using every trick in the book, first check on her sound based decoding, and, most likely, boost that foundation of her reading with Switch It and Read It. 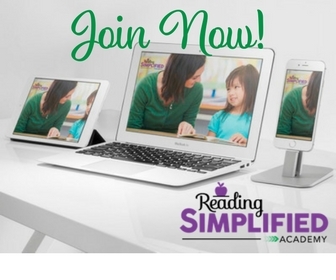 Then, or simultaneously, you’ll be ready to also implement our 2-part lesson plan that rapidly builds phonics memorizing! 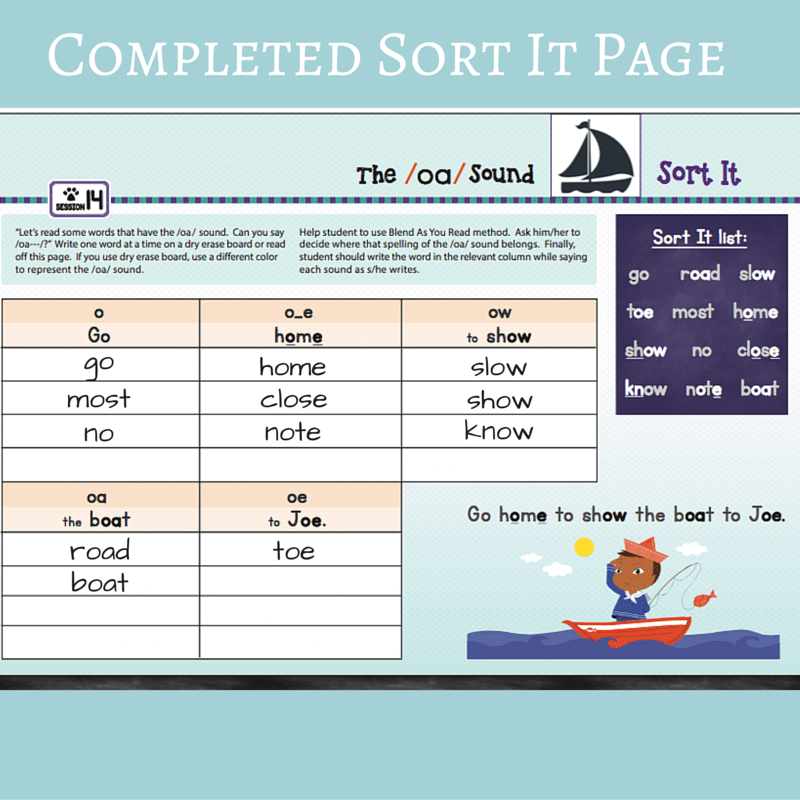 Sort It is a routine Word Work activity for students at the Advanced Phonics level (long vowels, diphthongs, and other tricky vowels besides short vowels). The words that the students are sorting all target 1 sound (i.e., /oa/) and its main various spellings (i.e., o, o_e, ow, oa, oe). After the students in a small group complete all or part of the Sort It page for Word Work, then they take turns reading aloud from a decodable text that targets the same sound and its various spellings. Finally, after discussing briefly the meaning of the text, students begin their hunt for all the spellings in the text of the target sound. They circle or mark with post-its or wikki sticks just the spellings of the target sound in the word (i.e., the “oa” in “boat”). Perhaps you’ve done something similar before and still some students struggle to memorize? A very small minority of students (based on experience and research, I suspect about 1%) DO need intense repetition and additional activities. I’m, indeed, very familiar with this struggle! I’m even working with a student like this right now. 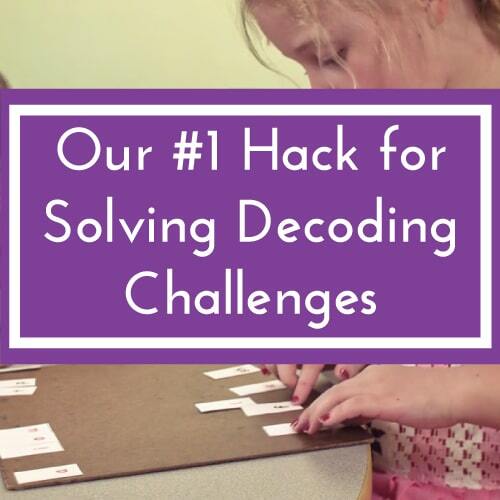 For these kids, I do the same things I’m recommending on this page, add in more games and other support, and increase the intensity of instruction. 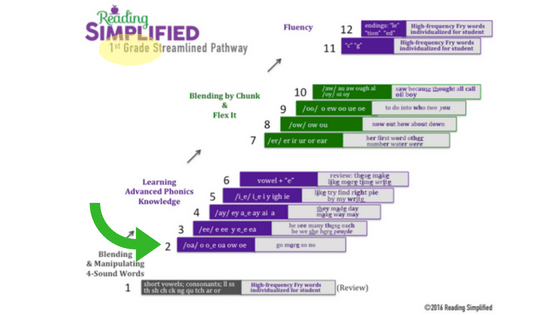 However, most students who struggle with memorizing phonics information can witness their difficulties fade away with the above 2 activities recommended for building a strong foundation (Switch It and Read It), as well as the nuances we suggest in the following descriptions of the streamlined pairing of Sort It and reading decodable text along with Search for the Sound. Repeating till at least each column has 1 word in it. 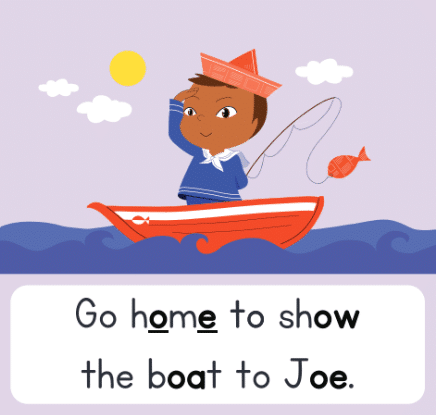 Along the way, students work on memorizing the Key Sentence for each sound, as in “Go home to show the boat to Joe.” Each time students complete a different Sort It sheet, or attempt to recall the /oa/ spellings, they see or consider the same Key Sentence repeatedly. Sort It organizes the main spellings by sound to be discovered all at once. It’s a graphic organizer that helps the brain sort–otherwise seemingly random information. Other programs drip out 1 or 2 spellings at a time, and often not grouped by sound. For instance, the students learn “oa” on Monday and “ie” on Tuesday and “er” on Wednesday, etc. This type of incoherent instruction is especially hard for those with poorer memories or those with less exposure to literacy. There’s no order to this presentation.It would be similar to a math teacher who teaches2 + 2 on Monday. And 3 + 7 on Tuesday. And 8 + 11 on Wednesday.No! She would focus on learning the 2’s all at once: 2 + 2, 2 + 3, 2+ 4, etc. so students observe the patterns.English is a funky written code….but it’s not random. Most words function in line with the principle that under girds the Sort It page–one sound can have multiple spellings. Thus, when we present the code in an organized manner, students’ brains find it easier to store and retrieve. That sounds like the work of their memories, doesn’t it? Sweet! 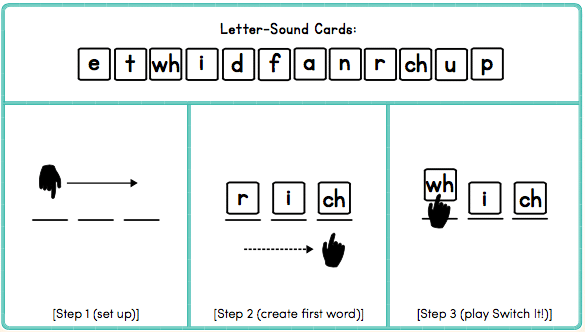 Sort It requires each student to say each sound as they write each letter-sound. This vital process builds on the decoding foundation that we considered at the beginning of this post. As he writes, /s/ /n/ /oa/, he’s linking the /oa/ and the “ow” more deeply.Indeed, researchers have recently showed that handwriting increases memory ability, as compared to other manipulative or passive activities. Writing and saying each sound is also another way to force the learner to notice the inside parts of words. He notices the “oa” more carefully if he has to say, “/oa/,” as compared to his brain alertness if he was just thinking the letter names as he wrote “snow”–/es/, /en/, /oa/. The Key Sentence serves as a helpful mnemonic to continually recall and organize the /oa/ spellings around 1 mental “file.” The Key Sentence contains words that represent each least 1 of the main ways to spell the target sound. And most of the words in the Key Sentences are from the Top 300 Fry word list.When the teacher reviews a given sound, she prompts the small group, “What’s the Key Sentence for /oa/ again?” And review sheets and posters can easily be created for all the target spellings that have been practiced. Thus, in a glance students have an organized tool for recalling lots of phonics knowledge! I recommend using Sort It pages and related center activities (such as sorting in a pocket chart) at least 3 days per week. But reading words in isolation isn’t real reading, right? This extra sampling of /oa/ sound words in the text gives the student greater opportunity to practice her newfound skill. In addition, as part of a classic Reading Simplified session, she would also re-read the passage several times. So she increases her exposure to the /oa/ spellings and these specific /oa/ words by three or four-fold. After checking on students’ comprehension of the passage by asking for a quick summary, the teacher would challenge the students to find all the /oa/ sound spellings. The students would be expected to circle the /oa/ spellings, such as “o” and “oa.” If time allows, they could point to where these words belong on a Sort It page or write and say them again and add them to the appropriate columns. Listen for the /oa/ sound instead of looking for the letter “o.” This is a critical reinforcement of sound-based processing. Observe–again–that the 1 sound (i.e., /oa/) has more than one spelling (i.e., o, o_e, oa, ow, and oe). 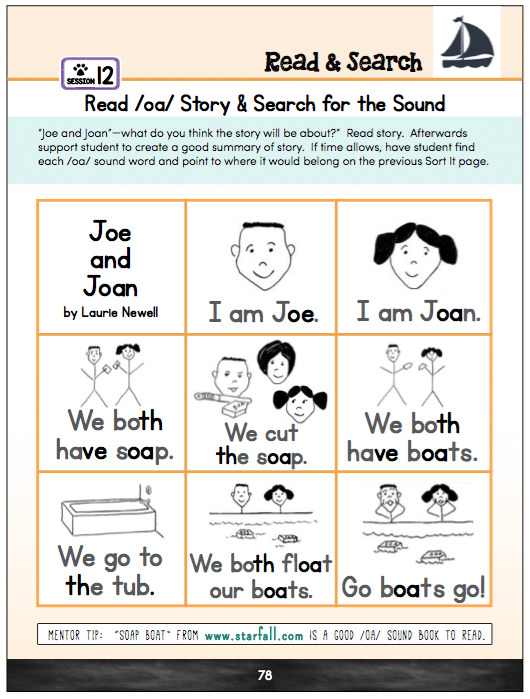 Altogether, this pairing of Sort It with Search for the Sound using a decodable text is a powerful combination that helps readers memorize phonics information quickly. Indeed, for typically developing students, they learn to recognize all these /oa/ spellings in about 1 week. After attacking the /oa/ sound and its 5 main spellings, a first grade guided reading might discover the main spellings for the /ee/ sound the following week. Only the diehard are still with me at this point, so surely you want to go try these activities with a student or group of students, right? 🙂 Enter your name and email below to get email access to a FREE packet of differentiated texts and Sort It pages to give this a try! One text is for 1st grade readers (with significant teacher support) while the other is for 2nd-3rd grade readers. After you’ve tried this pairing to help with phonics memorizing, please let me know how it went! I’d love to learn from you. Good luck! I teach first grade and last year I did something very similar to this. However, the powers to be, have implemented basically a very limited versions of phonics and phonemic awareness. It’s driving me nuts. Hey Pam, thanks for sharing your experience with something similar! Sorry about the change that you’re not thrilled with, though. 🙁 I wonder if you can “modify” a few activities that make the difference for your students. Been there, done that… do what you know is right for students. The pendulum has swung several times in my career. I painfully lived through the “whole language” epidemic in the late 80’s and early 90’s, and there is a whole generation that did not get basic reading skills, and a small fraction that figured it out on their own, or for their cognitive learning style whole language actually appealed to. Teaching phonemic awareness does not mean you will not read and expose children to rich literature, model how to read, demonstrate a love of reading, and teach comprehension skills. Take a balanced approach for all types of learning styles. Please link to free materials available? I think it’s fixed now, Cindy. Sorry! Yeah, Liana! Hope to hear how it goes…. I love your suggestions! Our school does the Heggerty Phonemic awareness program, however it doesn’t work in isolation without applying the manipulating and writing portions you talk about. Thank you! Thanks for sharing that, JB! Glad this was useful. I teach Special Education (K-7) in a low income area and have many disadvantaged scholars. I have 6th graders who are unable to read. I love your Montessori approach to phonics. I want to use this in my classroom this year. I expect it will greatly influence my scholars reading abilities. How can I get these materials for my classroom? Hi Pam, thanks so much for your kind words!! Hi Shirley! Thank you for reaching out! Thanks a million for such a life changing experience. Will change peoples lives to infinity. Hello Dawn! Thank you for your kind words! It is certainly my passion to change the world one reader at a time.